SOLD - THANK YOU ! 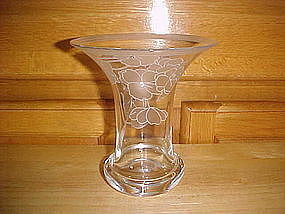 Beautiful crystal Art Glass Vase in Art Nouveau style designed and signed by contemporary glass artist ' LEONARD '. This Vase was made at the famous HUTSCHENREUTHER factory of GERMANY and is so signed on base. This vase is in Excellent condition and measure 5 1/2" high x 5" wide. MACIEL designed hand crafted silver bowl. This bowl is made of heavy gauge silver. 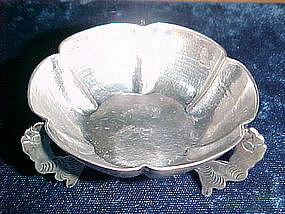 The bowl is supported by 3 bird form feet. This bowl measures approximately 1 3/8" in height and 2 5/8" in width. It weights approximately 2 Troy oz. and it is in very nice condition. The base is signed "MACIEL", Hecho de Mexico, 900/1000." Circa 1950. 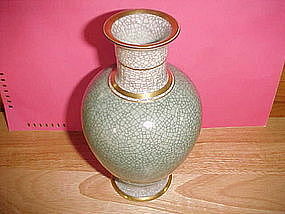 Wonderful pottery vase with green and gray crackle glaze and gold painted trim. This vase was made by " ROYAL COPENHAGEN " of Denmark. It stands approximately 6 7/8" tall and it is in EXCELLENT condition. 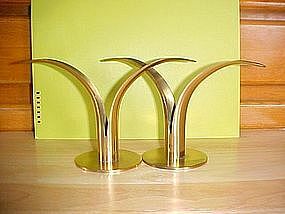 Pair of Brass Tulip leaf style candle sticks made by " THE HONST " in Ystad Sweden. They are 1950's Moderne and are in great shape and display usage ware on base. They each measure 4 3/4" high and 8" wide. They are signed on the bottom as per pictures.